Canadensis bed and breakfast travel guide for romantic, historic and adventure b&b's. 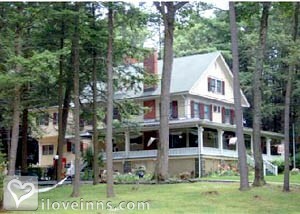 Browse through the iLoveInns.com database of Canadensis, Pennsylvania bed and breakfasts and country inns to find detailed listings that include room rates, special deals and area activities. You can click on the 'check rates and availability' button to contact the innkeeper. As the heart of the Poconos, Canadensis offers the slopes of famous ski resorts, such as Camelback, Alpine, and Shawnee. In the summer, horseback riding at the Pocono Manor and Mountaincreek is a favorite activity. The community also has a golf course, the Mount Airy Golf Club. Mount Airy Casino is a destination for those wanting to gamble. Shopping and antiquing is abundant at Liztech, Bendixens, Huttons Metal Craft, and Olde Engine Works. All these are accessible from Canadensis bed and breakfast inns and ask your innkeepers about the latest best dining opportunities or try Melogranos's Pine Hollow Restaurant and Coloney Village Restaurant. By Brookview Manor Inn.